I really enjoy stuffed green peppers, but I find they are a tad of the pain to make and don’t save too well for leftovers. 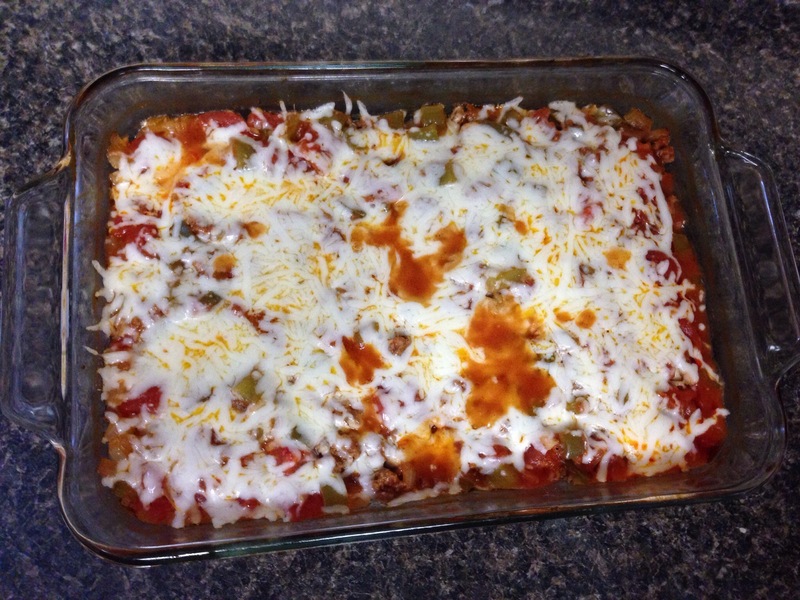 When I stumbled upon this casserole it intrigued me and I figured I would give it a try. 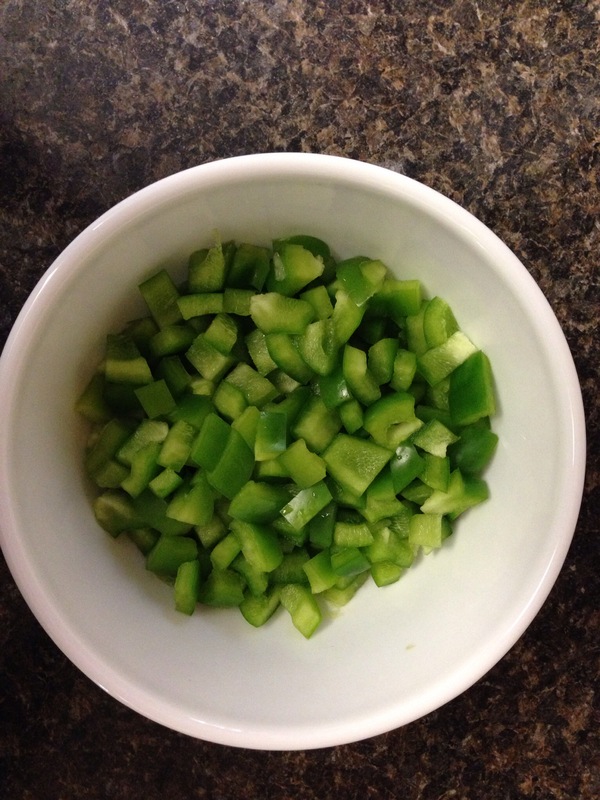 I’m really happy that I decided to, because it was great and a perfect alternative to actually stuffing the whole peppers. Yum! 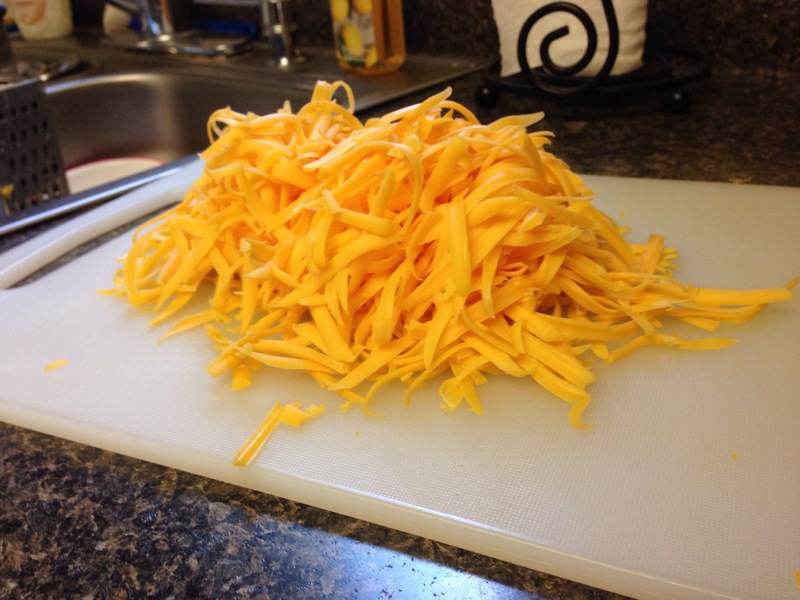 – 1 cup shredded mozzarella or cheddar cheese (I used moz. 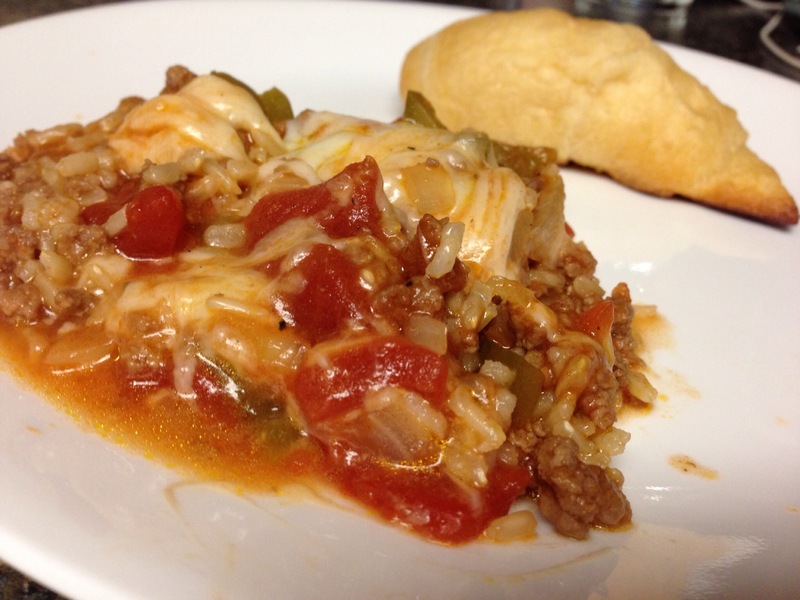 when I made this, but I think I’ll go with cheddar next time because it’s just so stringy)! 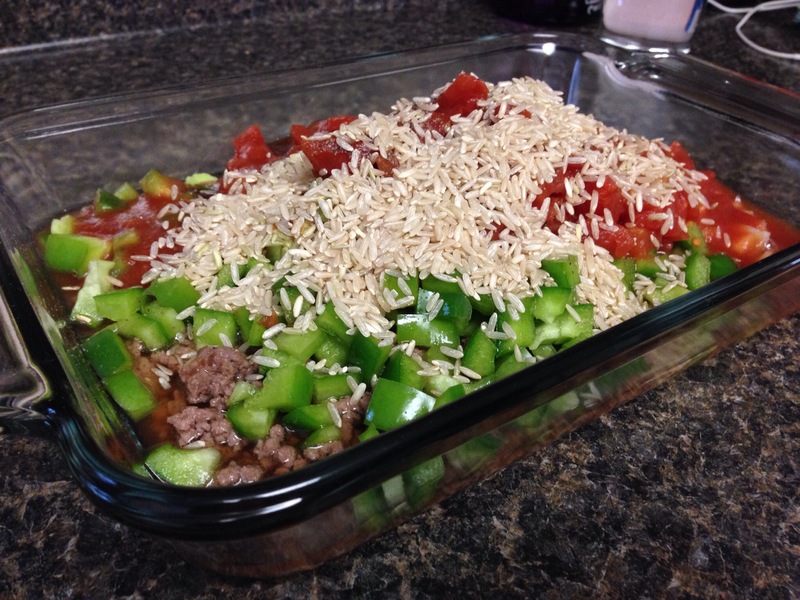 In a large skillet, add your ground beef and garlic and cook until browned. 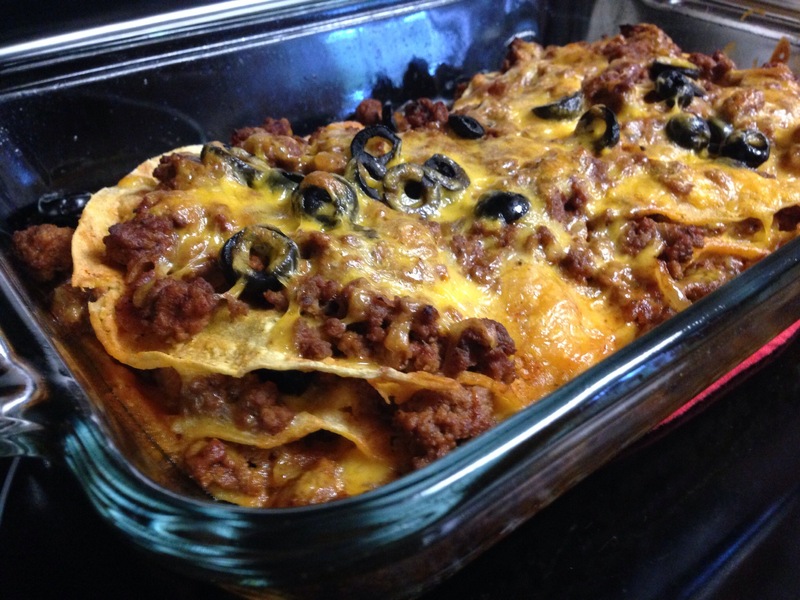 Drain fat and return to pan. 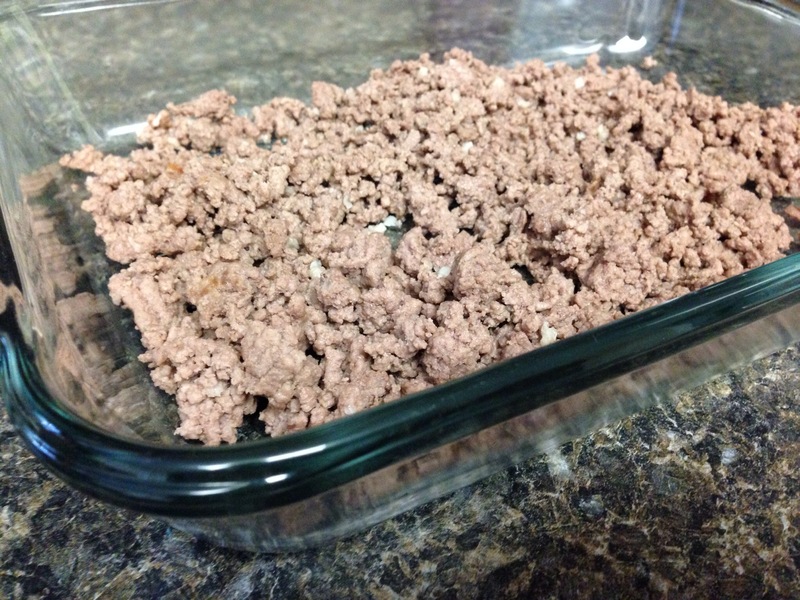 Transfer the meat mixture to an 8×11-inch baking dish. 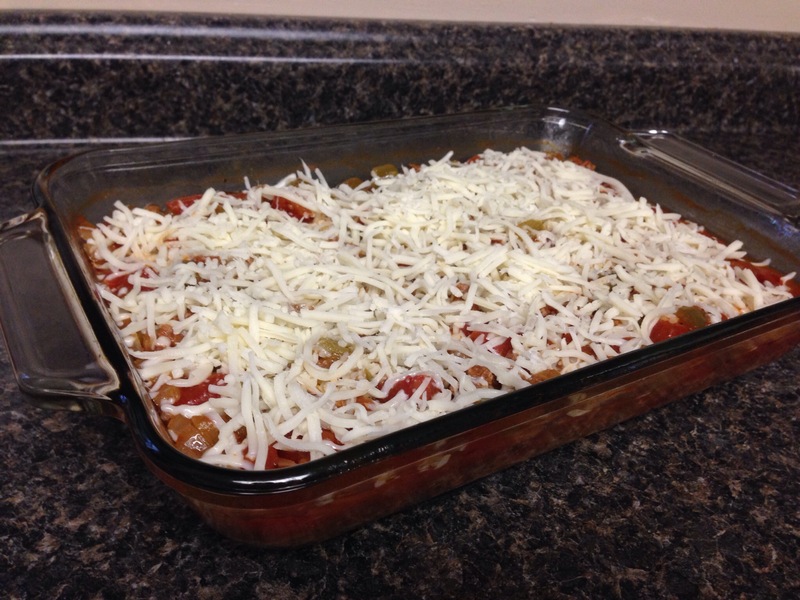 Add the rest of your ingredients right to the baking dish (except the cheese) and give it a big stir. 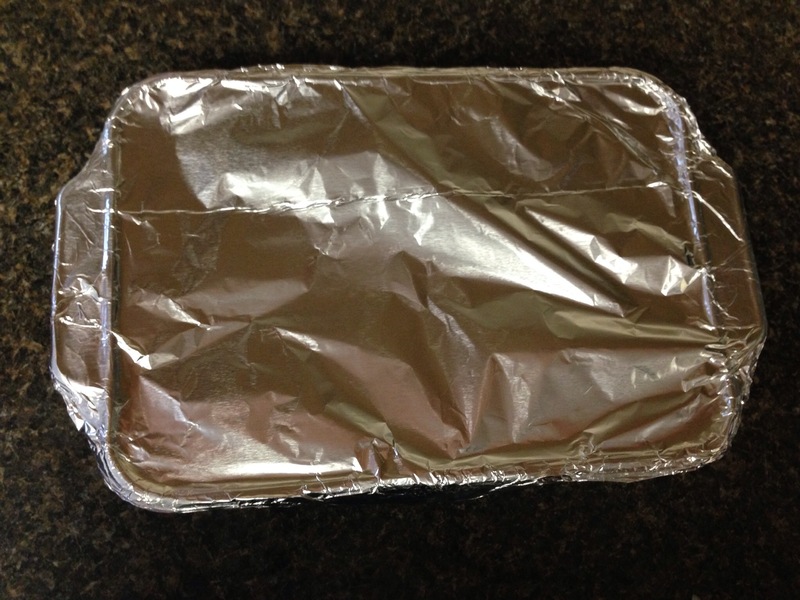 Cover with foil and bake for about 1 hour. Check the rice after the hour, I had to cook mine for about an additional 15-20 minutes so the rice would be cooked correctly. 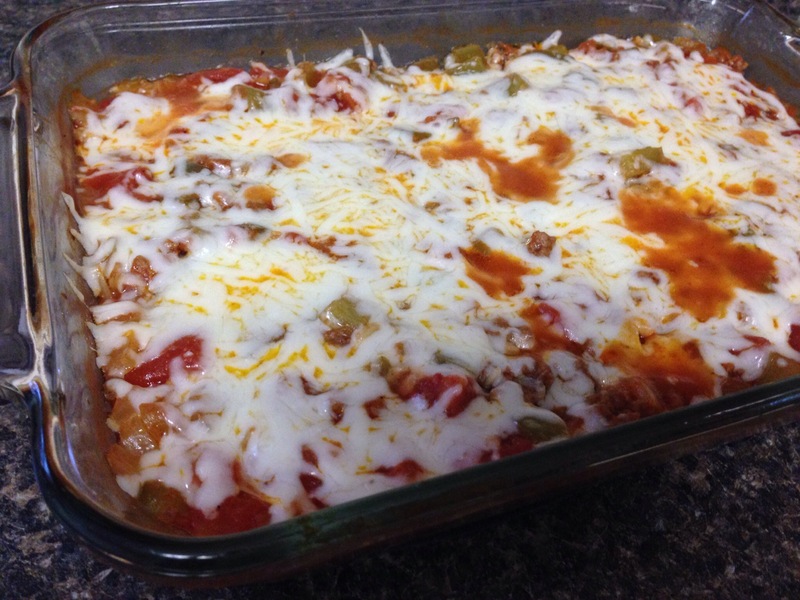 Remove casserole from the oven, sprinkle with cheese and put it back in to bake for about 5 more minutes. Let it firm up for about 10 minutes after removing it from the oven. Serve with warm bread. Preheat your oven to 400F. 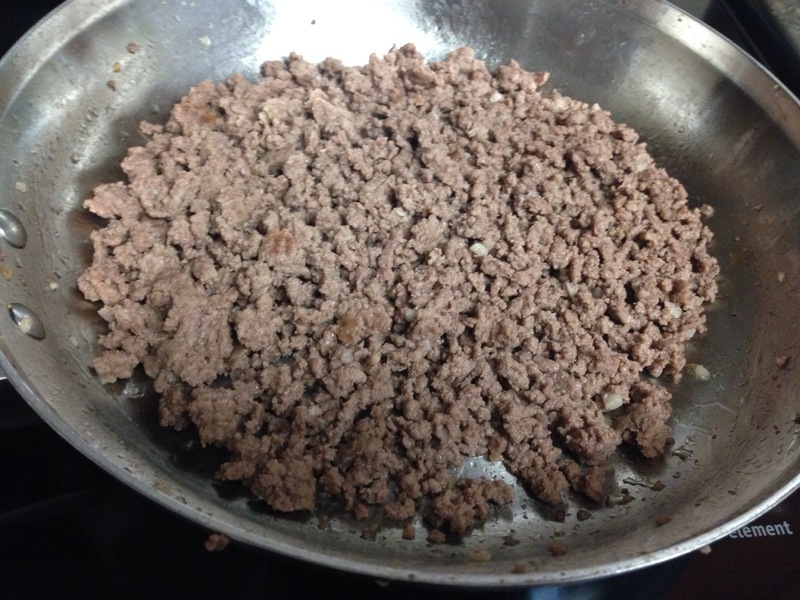 Brown ground beef and onion in a large saucepan. 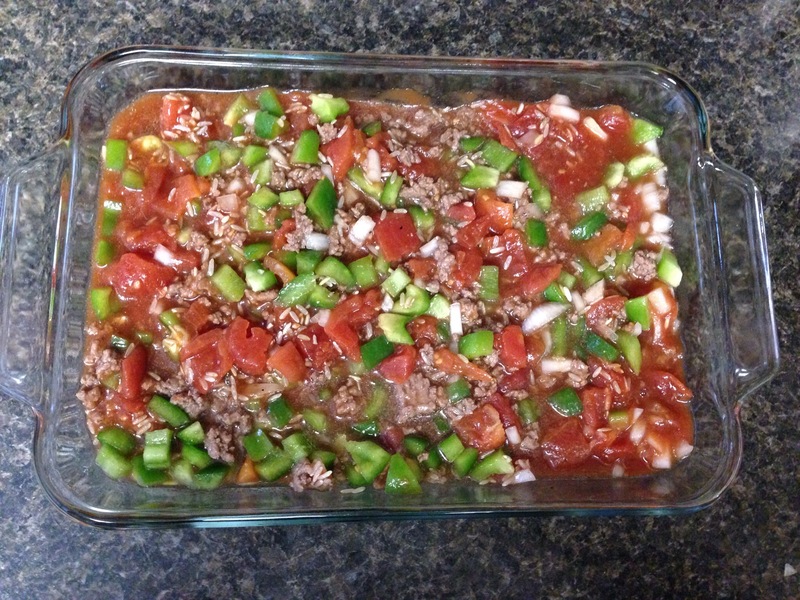 Drain the grease from the meat and add the chili powder, and tomato sauce to the pan. 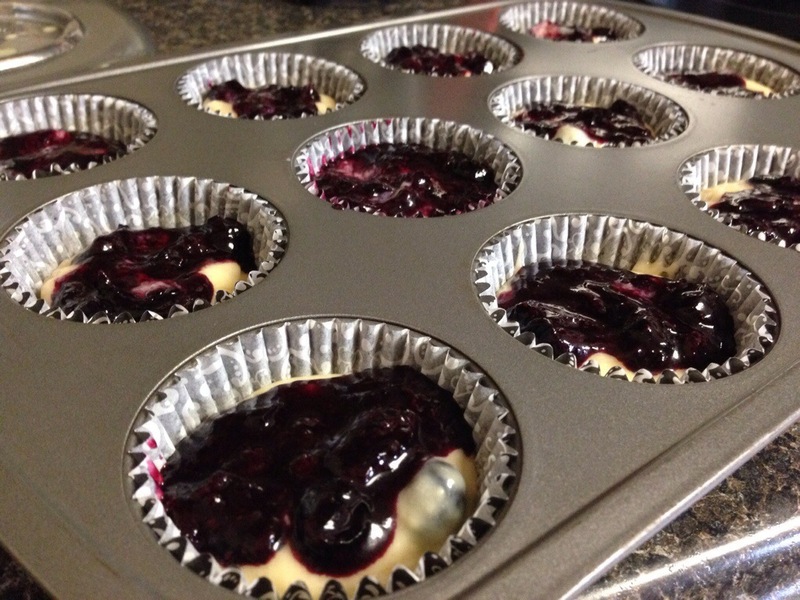 Spray an 8×11-inch baking dish with cooking spray. 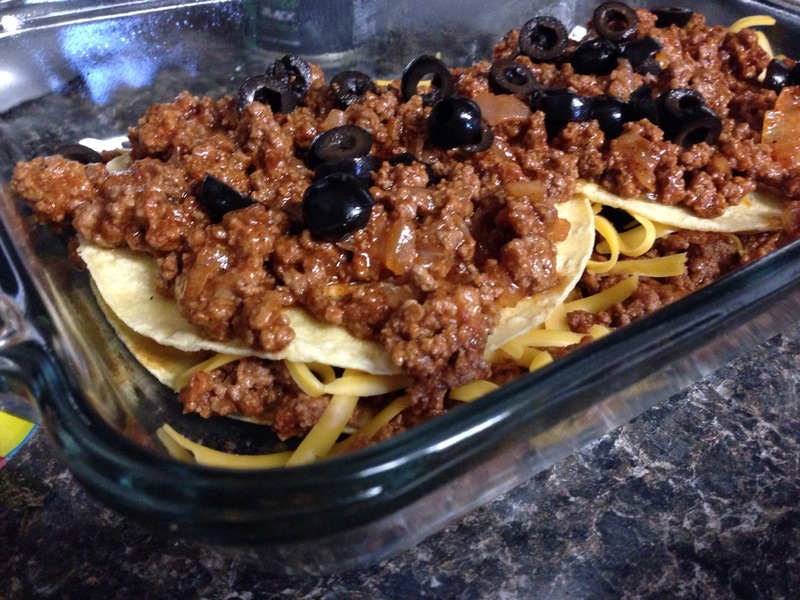 Start by laying two tortillas down in the bottom of the pan so they’re overlapping slightly, then add a layer of the meat sauce, then a layer of olives, and then finally a layer of cheese. Repeat the layers three times. 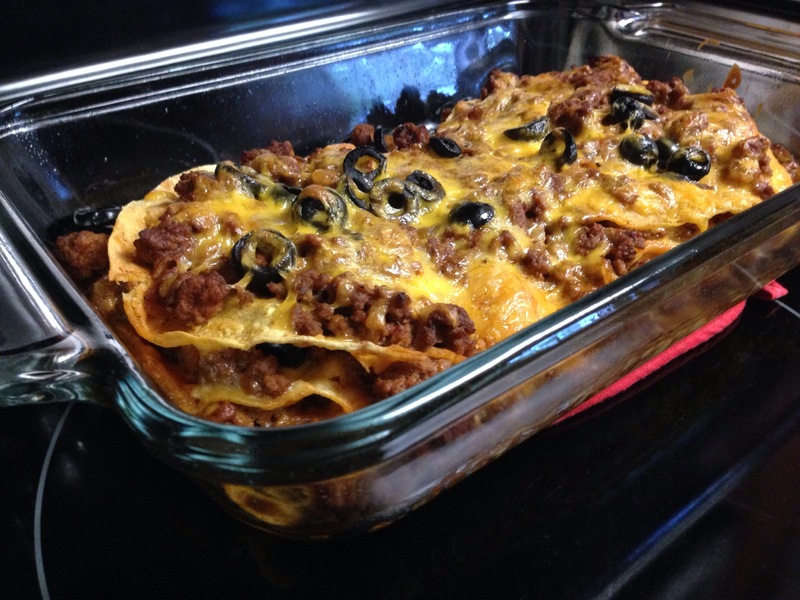 Pour the water over the top of the casserole and bake for 25 minutes, uncovered. 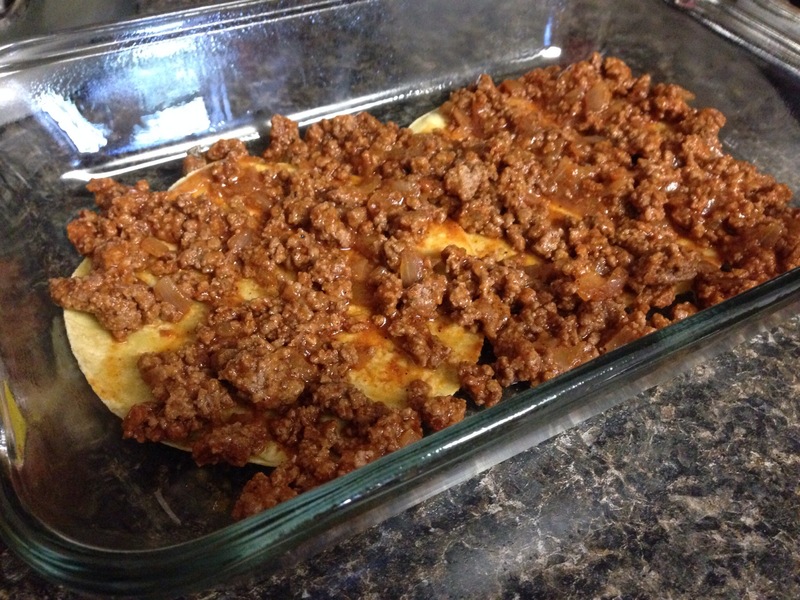 Remove from oven and let sit a few minutes to firm up. 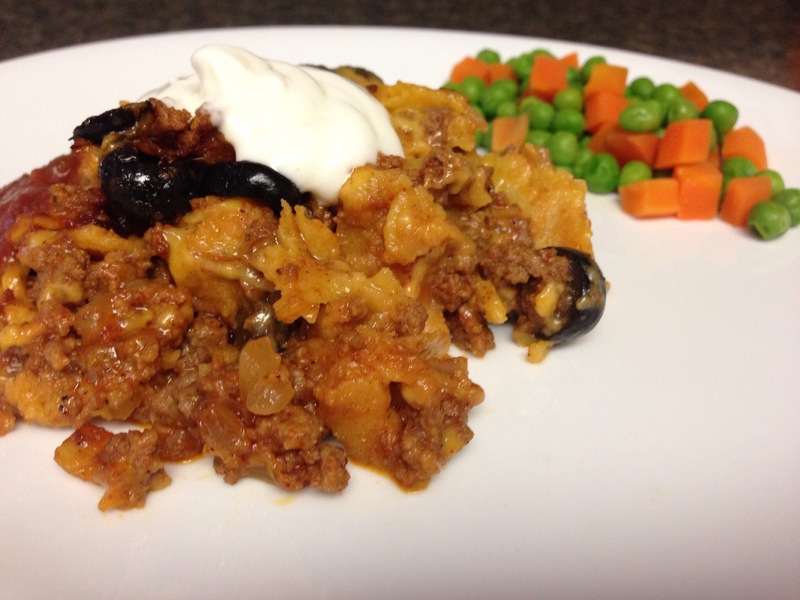 Top with sour cream, salsa, hot sauce, etc. 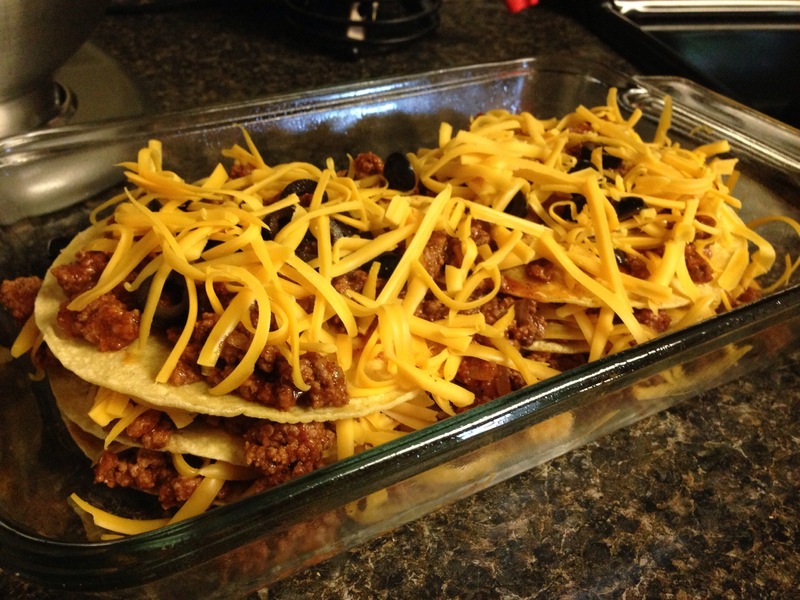 Begin by preheating your oven to 425F. 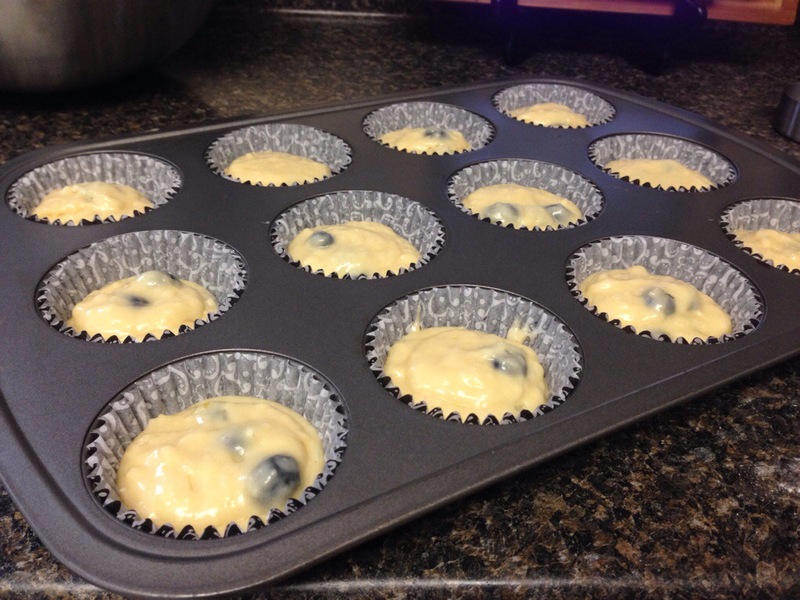 Line a muffin pan with cupcake liners or spray with nonstick cooking spray. Set aside. 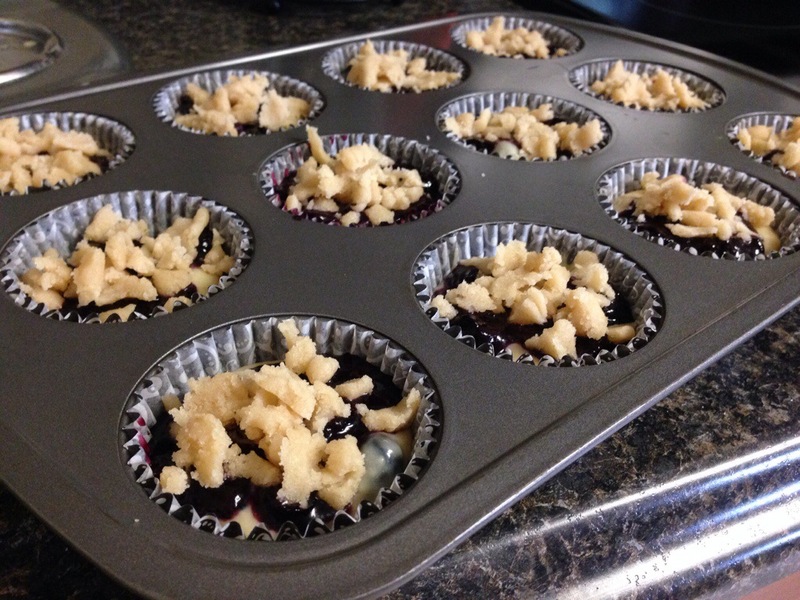 First make the streusel topping. 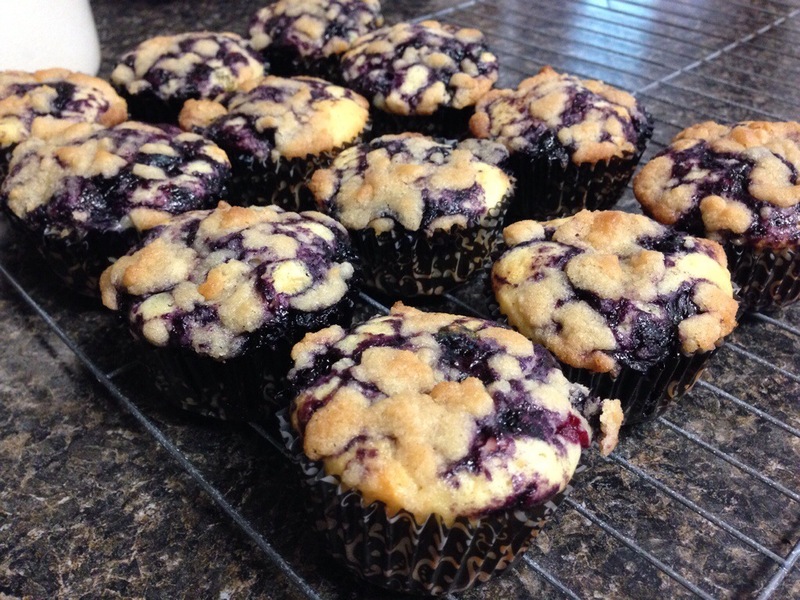 In a small bowl, combine the sugars and flour. 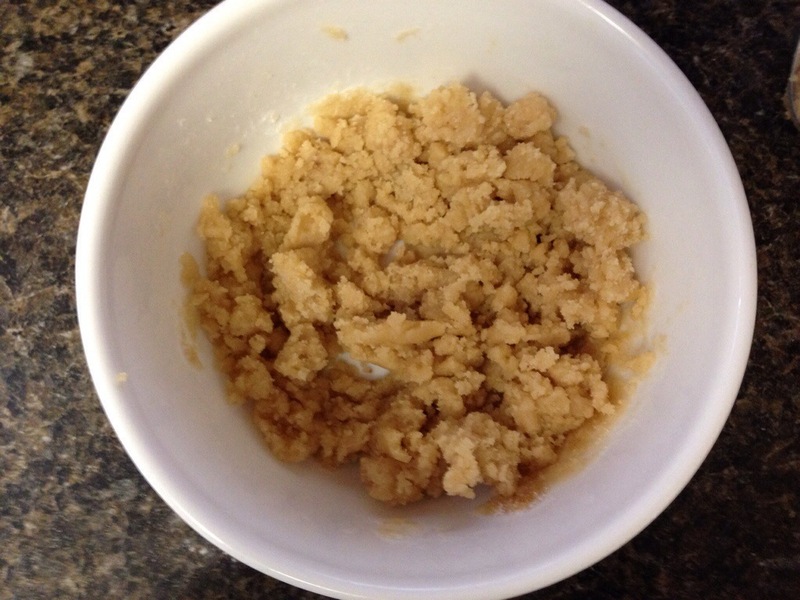 Pour the melted butter into the bowl and mix with a fork until it resembles a crumb mixture. Mine had slightly too much butter in it and it looked more wet, but it still came out great! 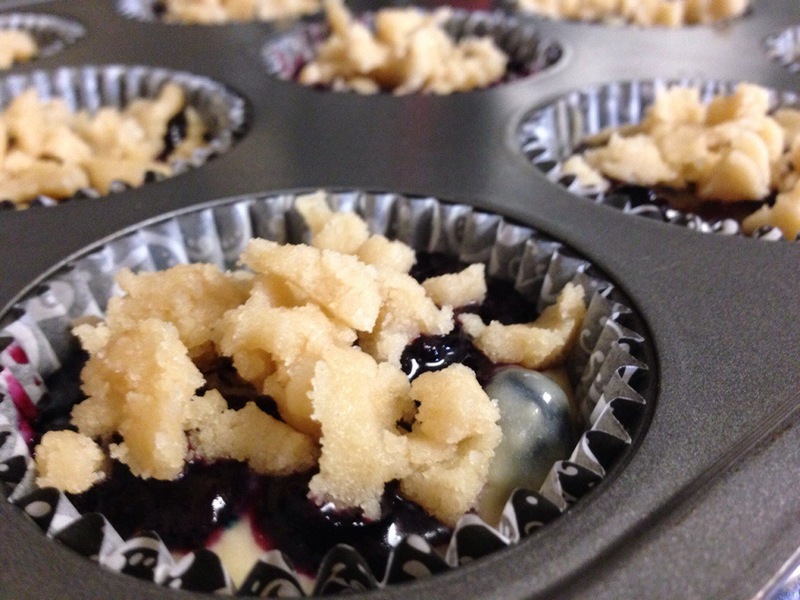 Set the streusel topping aside for later. 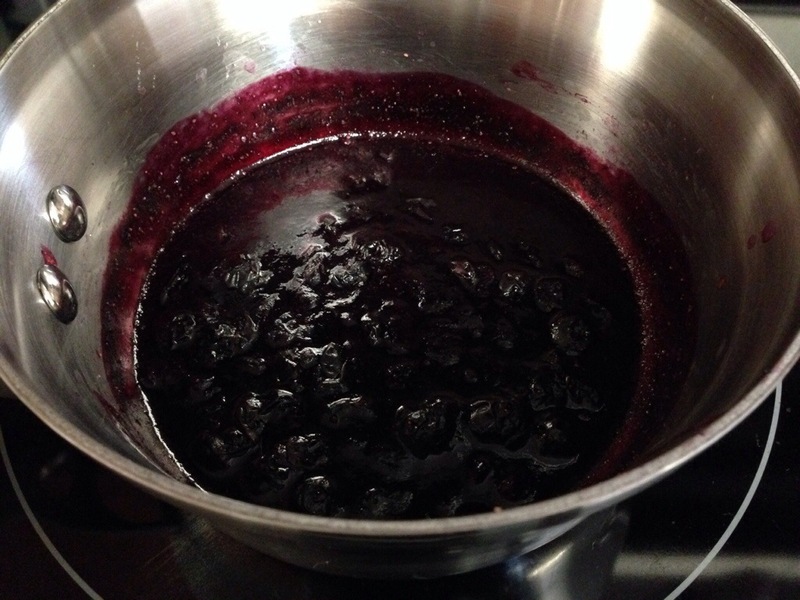 Next, we’re going to make the blueberry sauce. 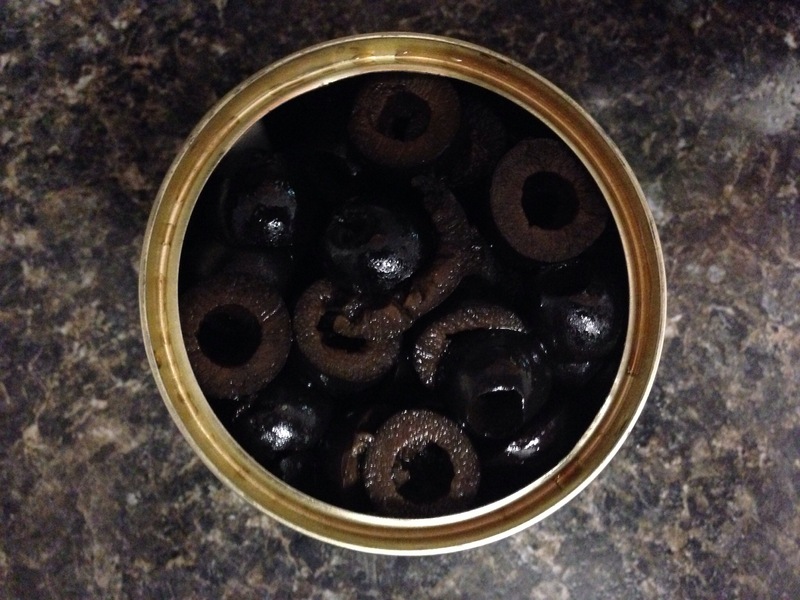 Place 1 cup of your blueberries in a small saucepan and add 1 tbsp of water and 1 tsp. of sugar to the pan. Heat the berries over medium heat and mash the berries with a fork. 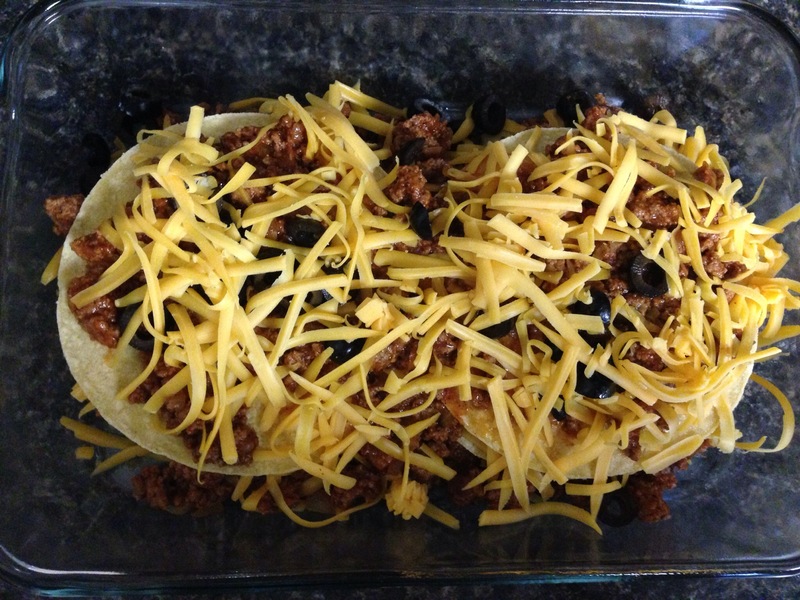 You can leave a few of them whole for added texture. 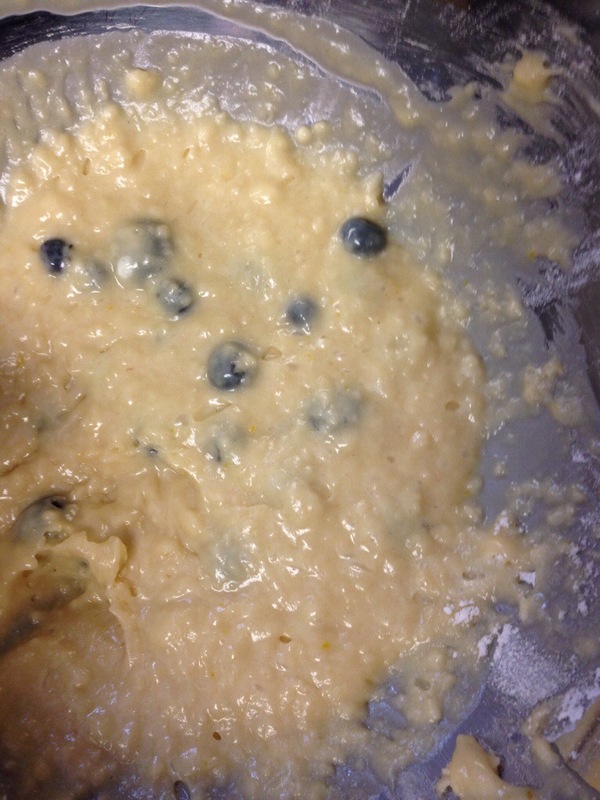 Stir and cook the mixture for about 5 minutes, until it reduces and thickens. Set aside to cool. 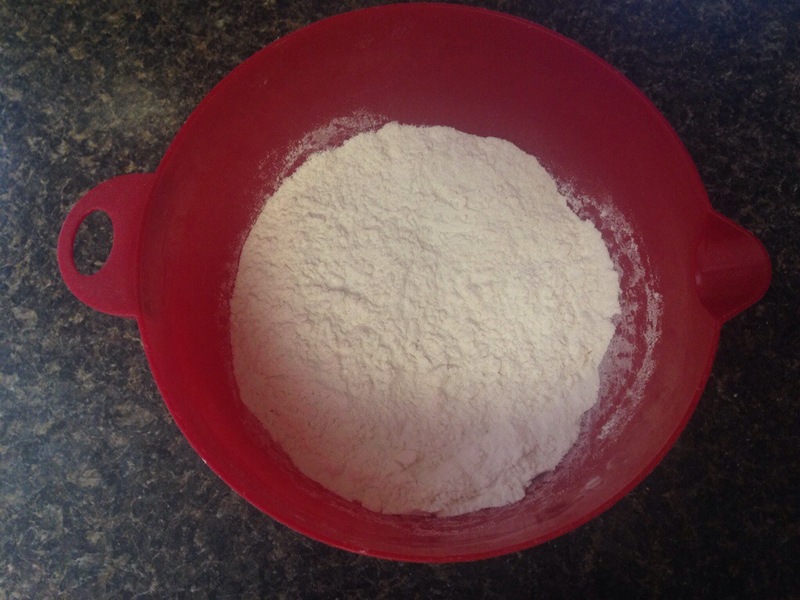 Now, in a small bowl combine the flour, baking powder, and salt. Set aside. 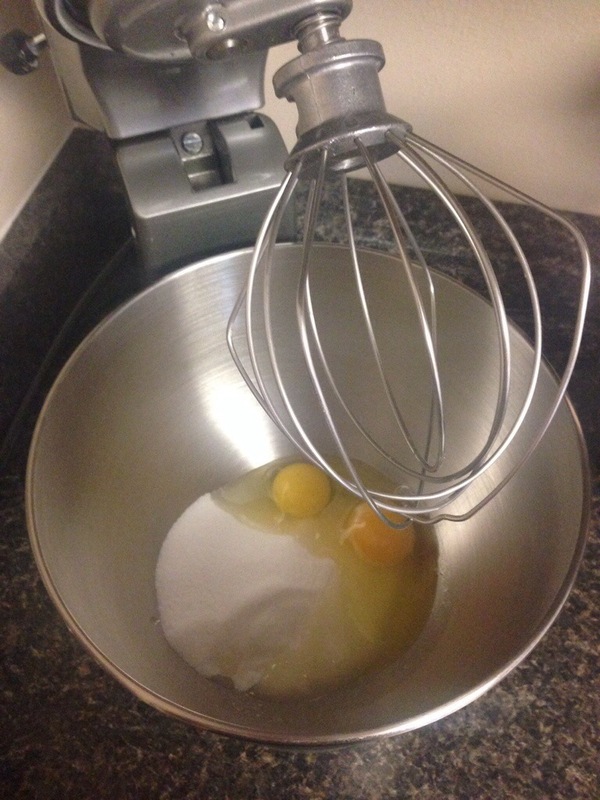 In the bowl of your stand mixer, combine the eggs and the sugar and beat them with the whisk attachment. Slowly add the melted butter and oil, mix until combined. 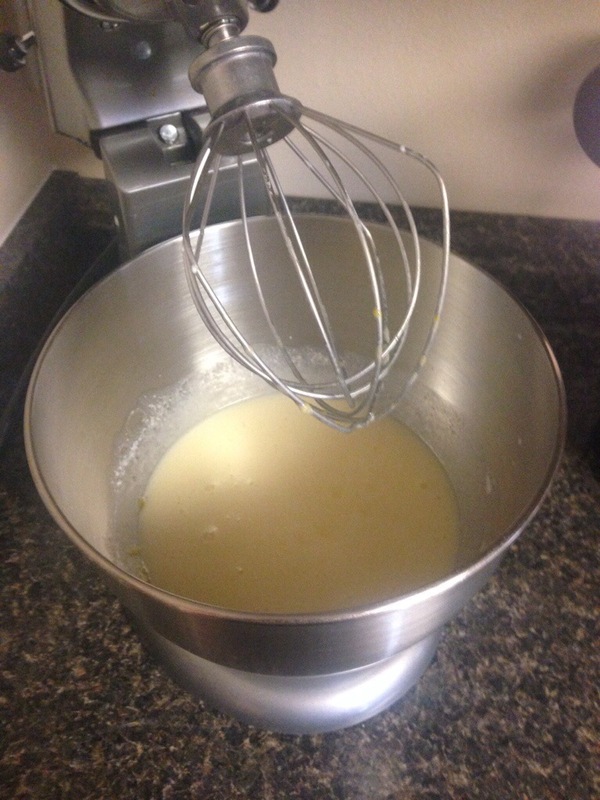 Then, add in the buttermilk and the vanilla. 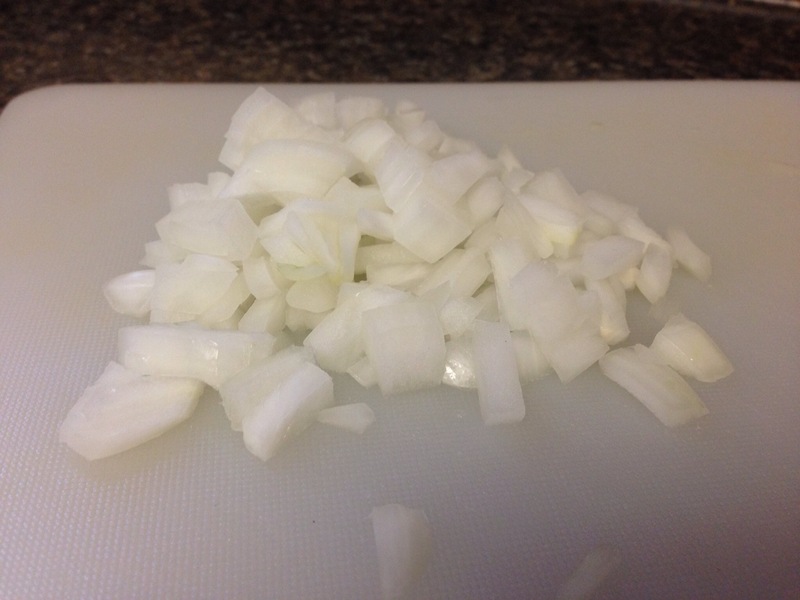 Beat a few minutes until all the ingredients are completely incorporated. 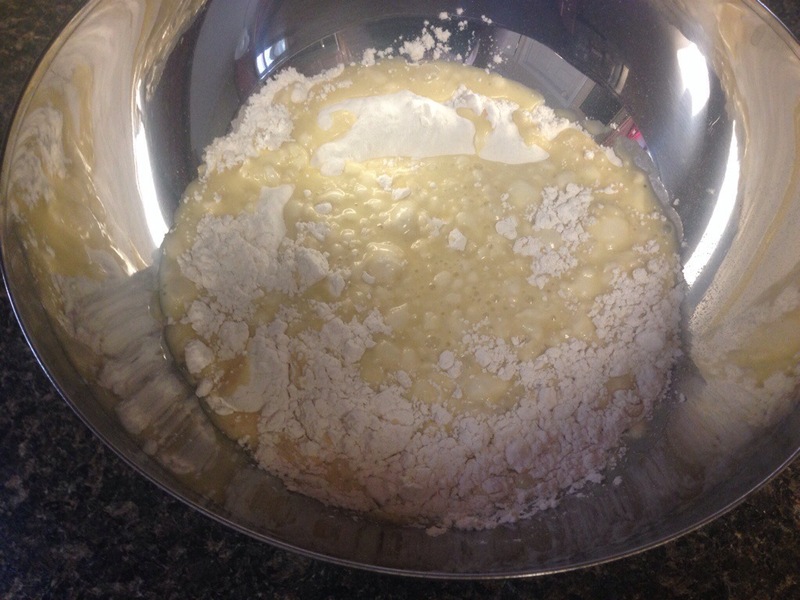 Pour the mixture into a larger bowl. 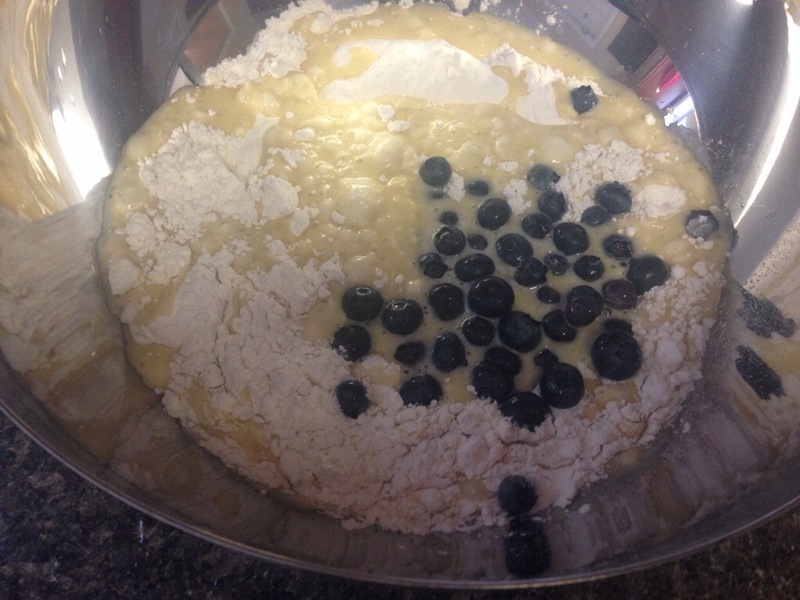 Using a spatula, carefully fold the rest of the blueberries and the flour mixture from earlier into the egg mixture. 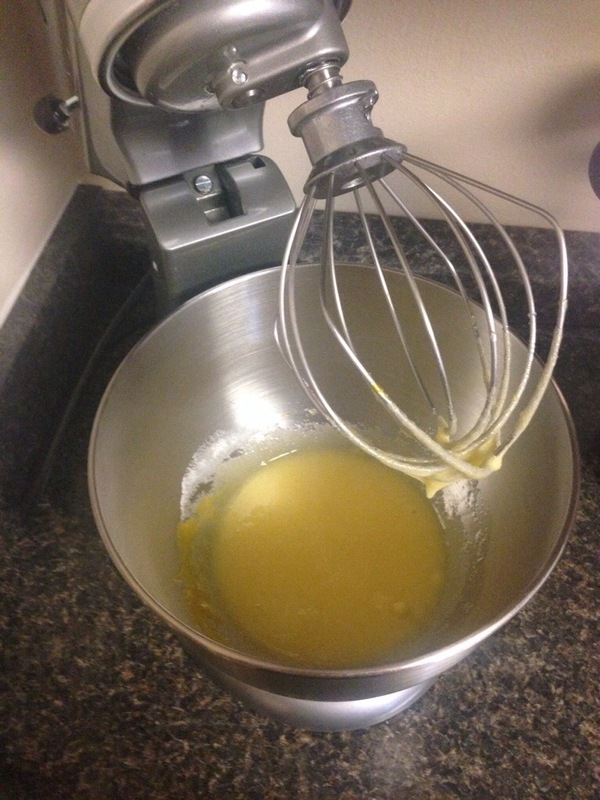 The batter will be sort of lumpy and thick. 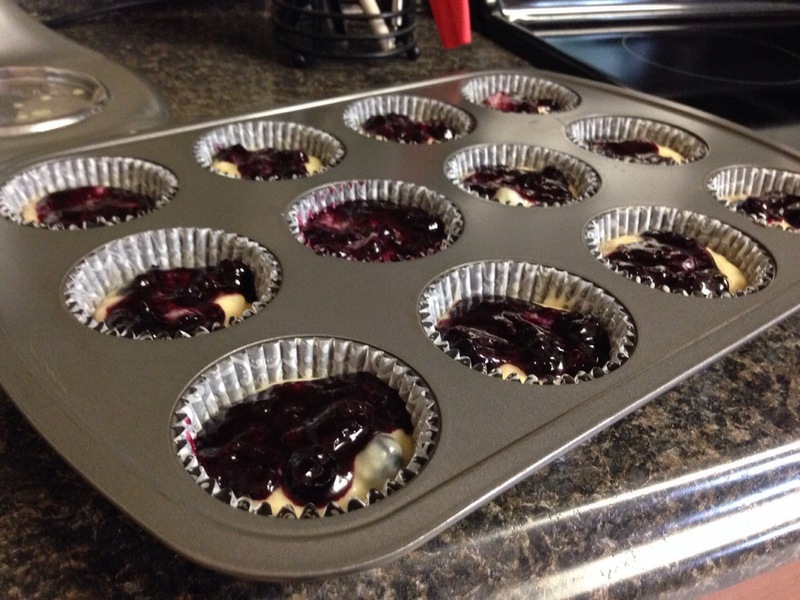 Now, take your lined muffin pan and fill the cups a little over 3/4 of the way full. You want the cups to be pretty full. 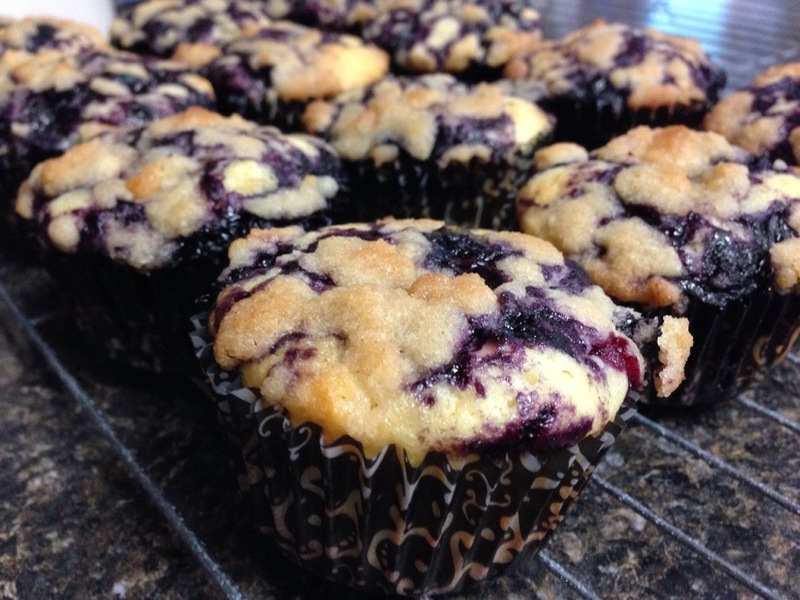 Now, take the blueberry sauce from earlier and place a dollup on the top of each muffin. Swirl it a little so that the sauce covers most of the top. 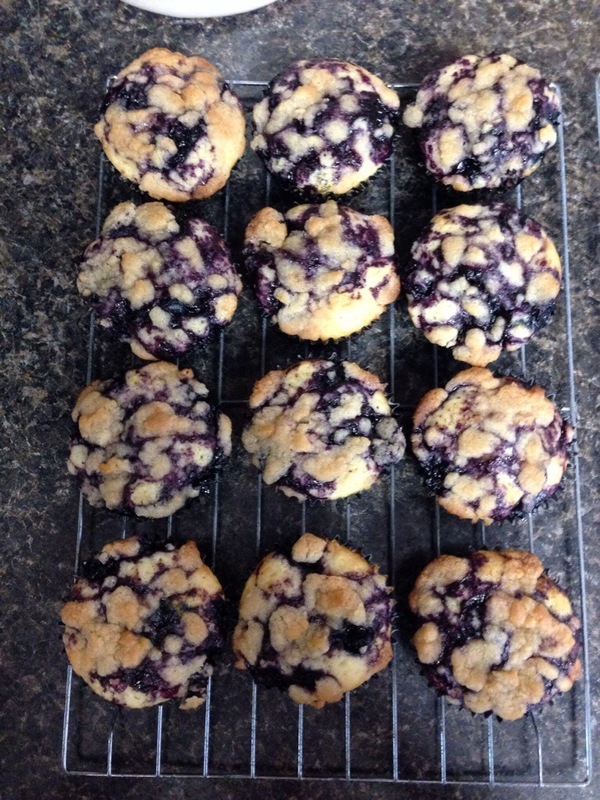 Finally, take your streusel topping from earlier ands prickle the topping right over the blueberry sauce. Be pretty generous with the topping, there’s a lot there! 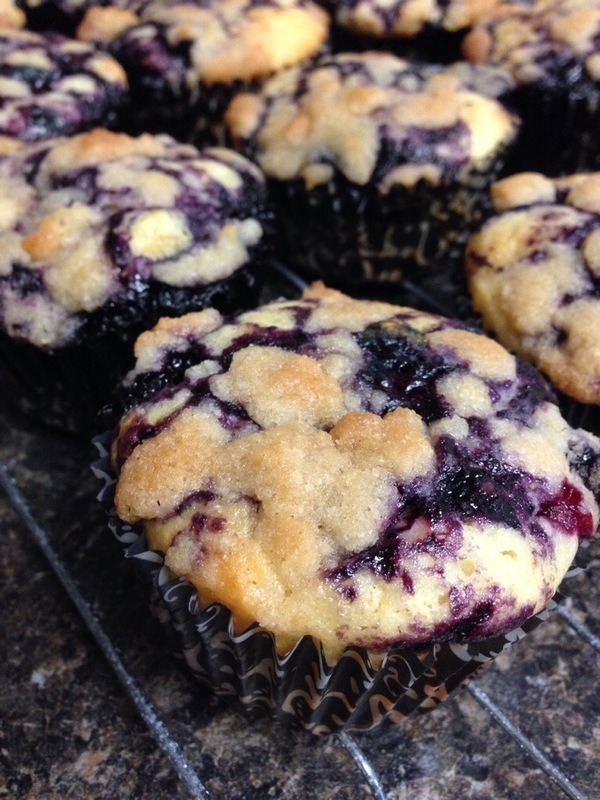 Bake the muffins in your preheated oven for 15-17 minutes until the tops are golden brown. 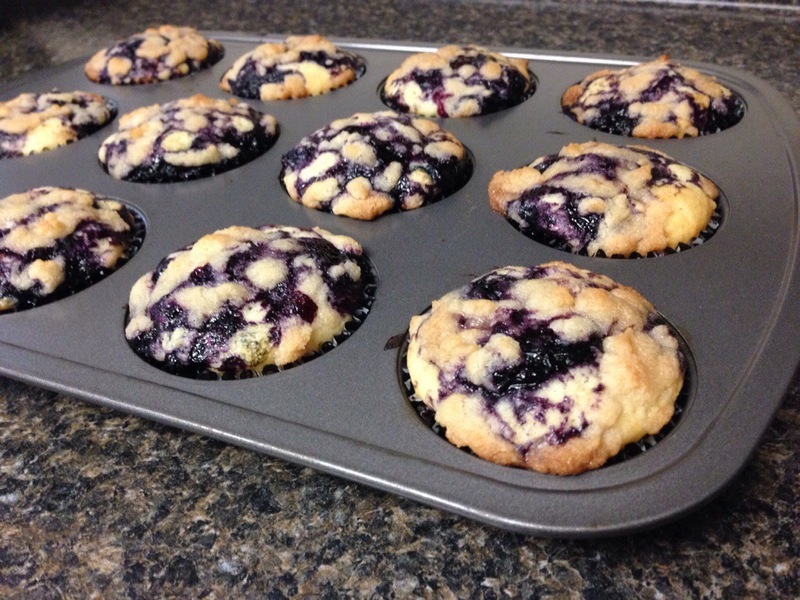 Once you remove the muffins from the oven, run a knife around the edges to loosen them from the tin. Remove to a wire rack to cool. Serve warm with a pat of butter, my absolute favorite! Mmmm!